In Turkey, has been given serious efforts to select companies potentially interested to solid biofuel certification system. Focus group meeting was organized in February 2017. Furthermore, a workshop was organized in October 2017. There were different participants from universities, ministries, solid biofuel producers, societies. TUBITAK contacted a lot of solid fuel producers and explained the project. The most suitable ones were selected from these companies which have ISO 9001 certification system.First, two companies were selected for the pilot audits. One of them is TARIS-Burhaniye which is an olive oil producer. 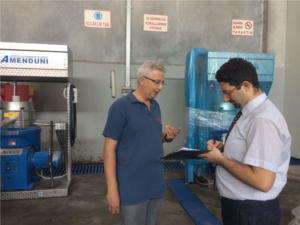 First pilot audit was performed on 17th of July by S&Q MART, an inspection body established at 1991, accredited by both TURKAK-Turkey and IAS-USA for the concession of the product certifications related to solid biofuels from agro-forestry processes, in accordance with ISO 17225:1 standard. TARİŞ is the common name of four-Cooperative Unions, the roots of which extend back to 1910’s, first for the products of figs and raisins and then for cotton and olive oil. TARİŞ Figs, Raisins, Cotton and Oil Seeds, Olive and Olive Oil Agricultural Sales Cooperatives Union, each having a legal personality at the incorporation stage. TARİŞ presently continues to make a common roof sheltering four different producer organizations under which 106 cooperatives are associated and 100.000 producers partners are organized in 7 provinces of Aegean Region. TARİŞ Burhaniye produces olive oil, olive pomace and olive stone. Olive oil production capacity is 5600 tonnes, olive stone production capacity is 2000 tonnes. Olive stone storage capacity is 1000 tonnes for a season. Olive stone is sold daily both bagged and bulk. The customers come with their vehicles and they buy the olive stones. In addition to checking the documentation, the plant and the biofuel sampling, the company and the inspector, based on their experience, have also commented and reported some comments to the latest version of the handbook translated by TUBITAK. In conclusion, both the Inspection body and the Company are interested in the certification, even after the end of the project. Lessons learnt of this auditing is that olive stone is not counted as a by-product but treated as a waste. Therefore, the company do not follow any specific procedure for records, storage, packaging, labelling, transportation, tracing or something else. The end users of these biomass wastes come to the premises of TARIS Company and make query for supply. TARIS Company sells these wastes with a simple consignment invoice as a kind of disposal means. Therefore, there is no traceability or customer satisfaction survey practice. To come over these troubles due to the lack of a well-established market execution, our institute will continue to go in search of standardizing and certification of biomass wastes as a feedstock for residential heating appliances. This is not only required for national needs but also will be asked for the exporters. So, our institute will bring the biomass labelling standards and regulations to the agenda of the Energy Market Regulatory Authority of Turkey, Turkish Accreditation Agency, Turkish Standards Institution, Agricultural Research Institutes and the other relevant stakeholders. To do this, sectoral expert meetings will be proposed to the relevant policy maker bodies, like Ministry of Agriculture and Forestry at the national platforms.